The polarization of light is one of the most remarkable phenomena in nature and has led to numerous discoveries and applications. The nature and mathematical formulation of unpolarized light and partially polarized light were not readily forthcoming until the 1950s, when questions about polarized light and the mathematical tools to deal with it began to be addressed in earnest. As a result, there is a very good understanding of polarized light today. 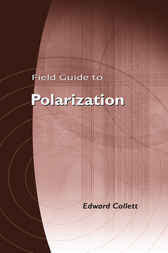 The primary objective of this Field Guide is to provide an introduction to the developments in polarized light that have taken place over the past half-century and present the most salient topics of the subject matter such as Mueller matrices, Stokes polarization parameters, and Jones matrices.